Warner Bros. has released a second full trailer for Rampage, which includes some exciting new footage. Fans get a glimpse at Malin Akerman's character, the villainous Claire Wyden, the creator of "Project Rampage," plus another look at the flying wolf Ralph, which is quite the change from the original video game. 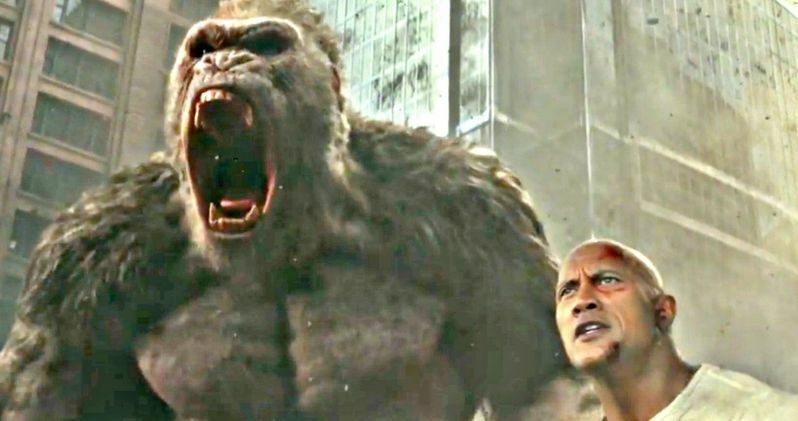 The end of this trailer may be the most intriguing, though, since it features Dwayne Johnson's character Davis Okoye teaming up with his old friend George the Ape to defeat the other Project Rampage monsters. Primatologist Davis Okoye (Dwayne Johnson), a man who keeps people at a distance, shares an unshakable bond with George, the extraordinarily intelligent, silverback gorilla who has been in his care since birth. But a rogue genetic experiment gone awry mutates this gentle ape into a raging creature of enormous size. To make matters worse, it's soon discovered there are other similarly altered animals. As these newly created alpha predators tear across North America, destroying everything in their path, Okoye teams with a discredited genetic engineer to secure an antidote, fighting his way through an ever-changing battlefield, not only to halt a global catastrophe but to save the fearsome creature that was once his friend. It's been clear through the earlier footage that Davis and George the Ape have a strong connection, and by the end of this movie, Davis has found a way to connect with George again, as they team up to save the world and destroy the other two Project Rampage creations. Rampage also stars Oscar nominee Naomie Harris (Moonlight), Malin Akerman (TV's Billions), Jake Lacy (TV's Girls), Joe Manganiello (TV's True Blood) and Jeffrey Dean Morgan (TV's The Walking Dead); as well as P.J. Byrne (The Wolf of Wall Street), Marley Shelton (Solace), Breanne Hill (San Andreas), Jack Quaid (The Hunger Games: Catching Fire), and Matt Gerald (TV's Daredevil). Peyton directs from a screenplay by Ryan Engle and Carlton Cuse & Ryan J. Condal and Adam Sztykiel, story by Ryan Engle, based on the video game Rampage. Rampage is produced by Beau Flynn, John Rickard, Hiram Garcia and Brad Peyton. It marks the third collaboration between Johnson, Peyton and Flynn, following the blockbuster hit San Andreas and Journey 2: The Mysterious Island. Serving as executive producers are Marcus Viscidi, Dwayne Johnson, Dany Garcia, and Jeff Fierson, with Wendy Jacobson co-producing. The creative team includes production designer Barry Chusid (San Andreas), director of photography Jaron Presant (2nd unit, Star Wars: The Last Jedi), editor Jim May (Goosebumps) and costume designer Melissa Bruning (Dawn of the Planet of the Apes). Music will be composed by Andrew Lockington, who created the scores for San Andreas and Journey 2: The Mysterious Island. The Rampage creatures are brought to life by acclaimed VFX supervisor Colin Strause (San Andreas, X-Men: Apocalypse), with five-time Academy Award-winning visual effects company Weta Digital (The Lord of the Rings Trilogy, Dawn of the Planet of the Apes). Production wrapped last July on Rampage, which opens in theaters beginning April 20, 2018, where it will go up against Fox Searchlight's comedy Super Troopers 2 and Focus Features' Tully. A New Line Cinema presentation, a Wrigley Pictures/Flynn Picture Company/7 Bucks Entertainment production, in association with ASAP Entertainment, Rampage will be distributed by Warner Bros. Pictures, a Warner Bros. Entertainment Company. Take a look at the new trailer below, courtesy of Warner Bros. YouTube. Will The Rock's Rampage Ravage A Quiet Place at the Box Office?